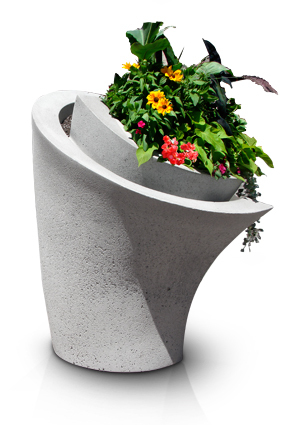 Add a splash of personality to any business entrance with these unique concrete wrap planters. Steel reinforced concrete construction makes these planters naturally vandal and weather resistant - the perfect outdoor decoration that lasts all year round. The heavyweight concrete is strong enough to support large root systems and also makes these planters great security barriers. These fun and playful planters can be used to enhance educational facilities, playgrounds, modern restaurants, shopping centers, and city hall buildings or can simply be used in residential areas to accent houses and apartment buildings. All planters come standard with drain holes for proper drainage. Concrete planters are especially useful in areas that may experience temperature extremes within 24 hours. They are virtually unaffected by freezing temperatures, resist splitting, will not be eroded with rain, and have a better chance of remaining upright in even the windiest conditions. Available color options and finishes shown below.